When I think “Thailand martial arts”, Muay Thai, Krabi Krabong and the various bareknuckle styles comes to mind. Little did I know that in the Southern region of Thailand, Silat is practiced instead of the indigenous Thai arts. 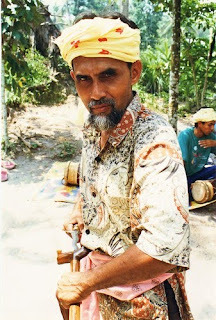 In the “Village of the Keris” DVD, some of the Sila (Thai Silat) as practiced in Southern Thailand are demonstrated from the various lineages. 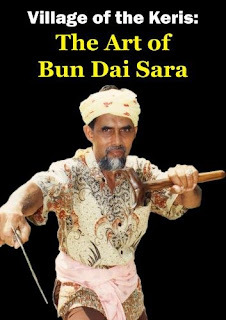 The meat of the DVD has Guru Atabu instructing on the making of the Keris as well as a form and application. Like Muay Thai’s 1-2-Round Kick, the “Village of the Keris” DVD is a good combination of overview, history, and technique. Excellent production values and good information makes this a good DVD. I highly recommend the “Village of the Keris” DVD to anyone with interest in Silat, Keris, Thai arts, as well as to any martial artists who contemplate travelling to different countries to train from the source. For ordering, please go to http://www.thaikris.com/.